Prevent costly and unattractive scratching and marring caused by typical school chair glides on VCT tile school floors. Floor Saver Glide® snap-on caps easily install over any existing school glide and work better and last longer than a felt glide or tennis balls. Click here for more information on how Floor Saver Glide® glides and snap-on caps can prevent floor damage and reduce your maintenance costs. Felt snap-on caps install over existing school glides. 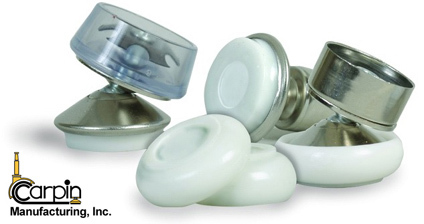 These caps will protect the vinyl floor from scratching and will eliminate the annoying screeching noise of chairs sliding on the floor. Easy to install. Available in a variety of sizes and colors. 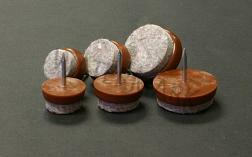 Felt nail-on glides install into wood furniture and provide a great alternative to stick-on felt pads. 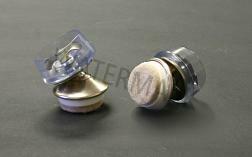 These glides will be securely attached to your furniture and will provide protection to your wood or tile floors. Carpin developed the innovative Quick-Snap Cap as a fast, simple, and cost effective way to refresh worn out Marquis style school glides without having to remove the old worn out glide. Constructed of heavy duty nylon with an overmolded felt or nylon glide base, the patented Quick Snap Cap features a one-piece 'clamshell' construction with a built-in hinge that keep both halves of the Snap Cap properly positioned during installation: a major advantage over two-piece products. Using a convenient insertion tool, the Quick Snap Cap installs in seconds with no more fumbling for parts. 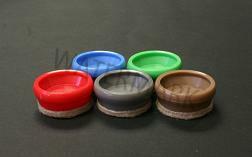 A variety of sizes and styles of school glides are offered with integrated felt base. The felt pad is adhered to the base of the glide and can not shift on the base. 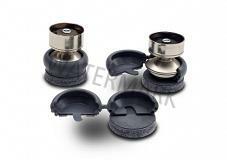 Replacement felt pads are available to rejuvenate older worn felt pads to make your glides like new. Offered in either smooth-bottom style for carpet or rough flooring, or in Floor Saver Glide® style especially made to prevent scratching and floor damage on VAT tile. Both styles are offered in a variety of sizes to fit all school glides. Easy installation will make your glides like new.